Sorry this post is so late! There is DRAMA going around over here. I will share as soon as everything gets settled. Congrats to Lisa for winning last week's EtsyInspired challenge! 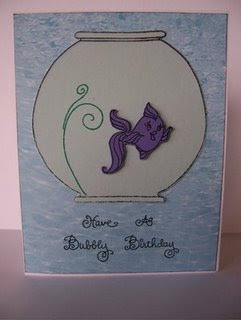 I love this adorable fish bowl card! So super cute! Love that fish image and I love the dimension! Lisa, please email me at actressangel at gmail with your full name, address, which onesie you want from the Kiddlebug store and in what size. Don't forget to do this week's challenge everybody! You could win an art print that's up to $55 in value! This is so cute Ashley. These are adorable images.